Click the cover to view the guide. 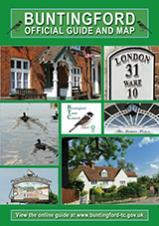 Buntingford has now got a newly updated Town Guide! A copy of the Buntingford Town Guide is delivered to every household in the town, however you can pick up spare copies at the Manor House.